When it comes to funny TV moms, Marion Cunningham of “Happy Days” is right up there on top. Without the slapstick visuals of Lucy Ricardo or the biting sarcasm of Roseanne, Marion Cunningham made us laugh with her sweet naÃ¯vetÃ© and honest responses to sitcom situations. SK: Marion, you are one of America’s favorite TV moms. How do you feel about that? MR: I think it’s a tremendous honor, I don’t know who did that, maybe my family. SK: You and Florence Henderson. The top two. MR: Last Mother’s Day, Gavin McLeod arranged for Florence and I to be godmothers of this ship. Fly to Rome, go on Emerald Princess, sail to Athens then on Mother’s Day we christened the ship. I have a rather nice life, don’t I? SK: Sounds good to me! So why are American’s still in love with Marion Cunningham? MR: Maybe it’s because I was so nice to Howard. (Laughs) I always figured, the young men writing those shows, it was their fantasy of what they wished their mothers were. I’d say to Gary Marshall, ‘don’t you think Marion should get a job, women’s lib is happening’ and he’d say no she’s fine the way she is. SK: What was it about Marion that made her so funny? MR: The funny stuff, for Marion was when something was out of character. If I didn’t get a literal joke, I’d try to change the tempo like, ‘Oh! I had a brilliant thought!’ SK: Do you think of yourself as a funny person? MR: I think I’m very funny. I like to make people’s faces light up rather than have them look at me and scowl. It’s awful; we’re such people pleasers. SK: Why do you think “Happy Days” has endured for all these years? MR: Look at those shows, you feel good when you watch them and there’s so much to feel bad about in the world. Historically, even, we were proud of ourselves back then, but now we’re not. SK: Does it bother you that, as long as your resume is, you’re still thought of as Marion Cunningham? MR: I don’t mind it because what I do, is if I need something, say I want the plumber to come, I call and say did you ever watch “Happy Days” and he comes right over and brings his kids and my friends can’t get anyone to come and do anything. I stick with it. SK: These days you’ve gone from TV’s top mom to TV’s top grandmother. MR: I really liked being a mother and now grandmother on “Brothers and Sisters” and on “Gilmore Girls,” what a terrible grandmother I was and on “That 70’s Show,” she had irritable bowl disease and smoked…and I’m SpongeBob’s grandmom, it’s wonderful! SK: You raised a TV family and two real life children. What’s the hardest thing about being a mom? MR: Hardest thing about being a mom – raising a kid. Must be harder now, there are so many distractions and the moral code is so wide open and all of our authority figures have been smashed to the ground. I admire families that stick together and have values, it’s hard but there are a lot of good families out there. SK: What’s something you’ve kept since you were a kid? MR: Nothing. We moved when I was young and sold everything. I do have a fake basketball I kept from “Happy Days.” They wanted Marion to walk out of the room spinning the basketball on her finger. Everyone in the company could do that and I couldn’t. I spent hours rehearsing and I could not do that. So they made a fake basketball out of Styrofoam with a fake finger. I put my finger in that fake finger and spun that basketball. SK: What’s a talent you wish you had? MR: I thinking singing. It’s a different gift. I really don’t sing. It’s a torture for me. I sing Noel Coward’s “A Bar on the Piccolo Marina” – if you come to my house, we’ll have a group in and I’ll sing it. SK: What’s something people would be surprised to know about you? MR: I like to remodel houses. I walk into people’s houses and say, this wall should be taken out, and this roof should be lifted. SK: Tell me about the real Marion Ross. MR: I’m just like I was in Minnesota. I’m a very nice girl. I was so high-principled and so much character, it’s a wonder I lasted. When I first came here, people told me that I wasn’t tough enough for Hollywood, but they’re all gone and I got to be Mrs. C. Sounds to me, like maybe good guys don’t always finish last. 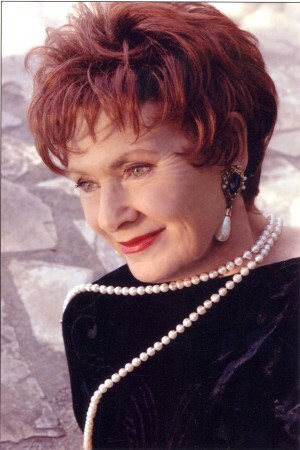 If you’re in Kansas catch Marion Ross in Joe Di Pietro’s “The Last Romance” (http://www.newtheatre.com/cs/cs_s17s1.html ) in Overland Park through mid-November. And be sure to watch for Marion on “TV’s All-Time Funniest: A Paley Center for Media Special” on ABC this Friday at 8:00.